I posted part 1 of the auto-deploying DLLs and other resources article last month. Although I will finish the part 2 article as promised, an interesting comment and subsequent email discussion / testing has prompted me to include this "intermission". The deployment framework has existed throughout quite a few versions of AX. when AX 2012 was released and we were all drooling over the Visual Studio projects in the AOT, one thing became clear: referenced DLLs within the project are not deployed like the DLLs built from the project. I tried quite a few options in the properties of the references to get the DLLs copied to the output folder etc, but nothing worked. Additionally, deploying other files from your project (images etc) doesn't work either. But, one attentive reader of this blog, Kyle Wascher, pointed out a way to edit your Visual Studio project file to have it deploy files to the output folder. Interestingly, AX honors these settings as opposed to honoring the regular properties in the VS project file. So, here's how you do it! 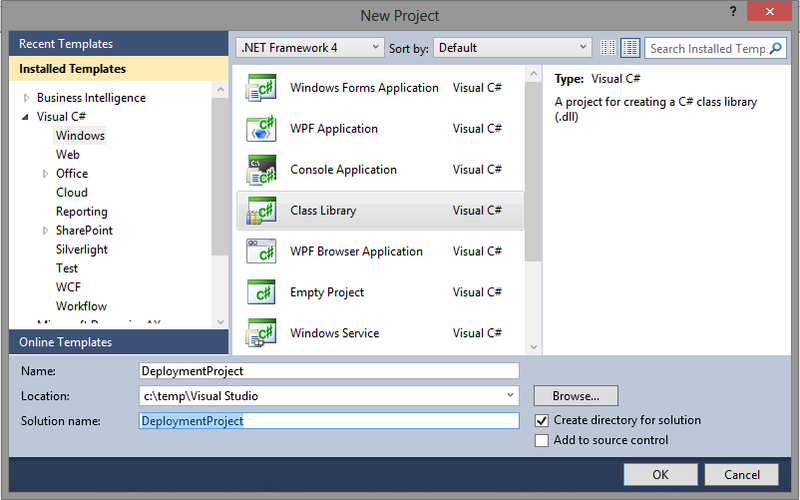 First, let's create a new project in Visual Studio 2010. I'm choosing the Class Library project type, and I'm naming it "DeploymentProject". 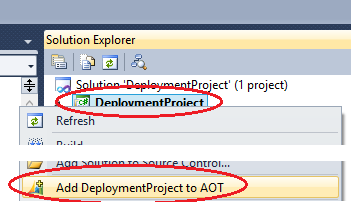 Once created, right-click the new project and select "Add DeploymentProject to AOT". Right-click on your project and select "Properties". Make sure to select "Deploy to client" (or deploy to server or client or EP or all of them, depending on your scenario). For this test I'll just set Deploy to client to YES. Of course, we need a DLL to deploy. I'm going to create a new project/solution but of course that is NOT a requirement, you can pick any DLL you have created anywhere or downloaded from third parties. Shift-click on Visual Studio in your Windows taskbar to start another instance of Visual Studio. Create new project,again I pick the Class Library project type, and I'm naming it MyDLL. After this, my project looks like this. Again, creating this new project is just an illustration of a DLL we'll deploy, it's not needed to make this work. 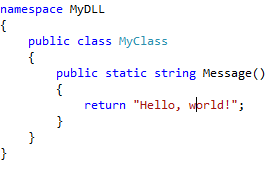 As an illustration for later, MyDLL contains a public class MyClass with a public static method "Message" that returns the string "Hello, world!". Since the code is irrelevant I'm just putting a screenshot up here. On a side note, it seems if you create another project within the solution where you create the AX VS project, the new project will also be added to the AOT, which of course defeats what we are trying to do here. Make sure to build this DLL so we can use it. Ok, so now there are two ways to have the DLL be part of your project. One, you add it as an actual reference. Or two, you just add it to your project as a regular file. In this example, I will add the DLL as a reference in the project. This will allow me to actually also use the DLL in the project itself, which I will use further down as an example. This is also the most common scenario where one needs to deploy an extra DLL. So, go back to your AX VS Project "DeploymentProject", right click the references node in your deployment project, and click "Add reference". 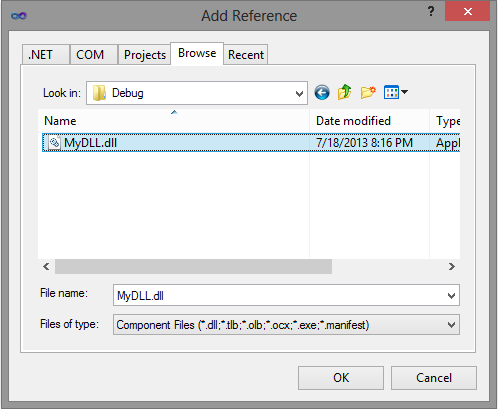 On the "Add Reference" dialog click the Browse tab and navigate to the MyDLL.dll we built in the other project. You'll find that DLL file in your project's folder under bin/debug or bin/release depending on which configuration you used to build. This is exactly what we need. Click "Reload". Now, we've edited the VS project on disk but it's not in the AOT yet. Normally, VS updates the AOT any time you click save. Unfortunately, in this case you just reloaded the project from disk so VS doesn't actually do anything when you hit save, as it doesn't think you've changed anything. So, the easiest thing you can do is just click the "Add DeploymentProject to AOT" option again, as we did in the beginning. This will force an entire update of the project to the AOT. Ok, so now (remember I had "Deploy to Client" set to yes) I will just open the AX client. And as explained in my article on VS Project DLL deployment, you should see both the DeploymentProject.dll and the MyDLL.dll files appearing in your Users\youruser\AppData\Local\Microsoft\Dynamics Ax\VSAssemblies. Now, as for using the code of MyDLL. Remember we added a class and method there. However, the DLL is referenced in the VS project, but not in the AOT. So, your code inside DeploymentProject.dll can use that class, but your X++ can only use the code from DeploymentProject.dll. If you need access to the MyDLL.dll code from X++, you will need to manually add a reference to that DLL in the AOT still. Now, at that point you point it to the location of the DLL, but at runtime (or after you deploy the code to a test or production environment using models) AX will just try to load the DLL from its known search paths, which will include the VSASSemblies folder in your appdata. So as long as you include the AOT reference as part of your model, this trick will work everywhere. As a final note, you can use this to deploy ANY file. You can right-click your project and select "add / existing item" and select a JPG file for example. In the properties of the file, make sure to set the "Copy to Output Directory" flag to "Copy always". Then, just add another VSProjectOutputFiles node in your csproj file. I have issues with adding larger dlls (3MB+) to VSProjectOutputFiles. VisualStudio Error is: The operation failed due to an issue with connecting to the AOT. The connection has now been restored. You must redo the last operation. Interesting info, however in 2012 R3 the files only ever appear in the server VSAssemblies folder, never for the client. I wonder if this is broken in R3. Don't think I've test in R3, but remember the code runs client or server side by the way you design it, so at least you should be able to debug the code easily and see why it's going server side. I just tried this on a AX2012R3CU10. The referenced .dll is indeed deployed to the server VsAssemblies, but not to the client VSAssemblies. A real petty I would say. Should work for client-side as well. Check the other articles in this series of posts. Great article Joris! I was able to make it work with your example for AX2012R3CU8. However I cannot get it to work with the Microsoft.ServiceBus.dll reference I added with NuGet. AX is not deploying the dll in the client assembly folder even after updating the csproj file. However it is deployed in the server assembly folder. Not too sure why it's working in one scenario but not the other one. With VS 2013 and AX 2012 R3 cu9 deploy seems not work on client but only for server. Joris, Thank you very much! it helps me a lot! Hi Joris. I appreciate your articles. One question on this one though: The referenced DLL in the VS project is not included when I migrate code from DEV to STAGE using VSTS. Is there another step in the process that is required so that the referenced DLL is included in the code migration? I think I sorted it out. I opened the VS project again and ran Deploy and then copied it to the AOT again, and now it shows the additional DLL in the Project Output folder. Running sync and compile on STAGE to confirm that it took care of the problem. Not sure what fixed it. I opened the project in VS, ran deploy, got an error about hot-swapping of assemblies not being enabled in STAGE, so I enabled that and restarted the STAGE AOS. 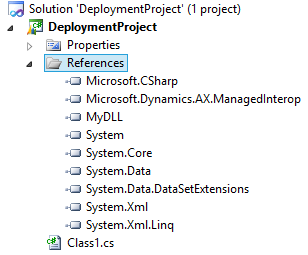 I checked the VSAssemblies folder, and now the referenced DLL is there. I think your suggest doesn't work when the VS project is promoted to stage or prod using VSTS. The extra DLL is not deployed, and I have to deploy it manually every time.